After going through several websites and documents, I sadly discovered, like many of you had before, that HP haven’t yet published any reference architecture or certified design documents for different needs. I decided to write a series blog articles to create reference architectures for SIEM deployments, basically for HP ArcSight, but the fact that solution components are more or less similar in different vendors, I believe they will be applicable to all SIEM environments. Gartner defines a small deployment as one with around 300 log sources and 1500 EPS. A midsize deployment is considered to have up to 1000 log sources and 7000 EPS. Finally a large deployment generally covers more than 1000 log sources with approximately 15000 EPS. There can of course be larger deployments with over 15000 EPS but architecture-wise they can be considered as very “large” deployments. In this article, I will give the details of a midsize deployment, covering components both for a primary datacenter and a disaster recovery center, working in an active-passive setup. The reference architecture for midsize deployment is for a scenario where the company needs both a long term log storage solution (ArcSight Logger) and Security Event Management and SOC capabilities (ArcSight ESM). The scheme below shows how different components of the architecture are set up. In this setup software SmartConnectors are used to collect the logs. Up to 8 software connectors can be configured on a server and 1 GB of memory should be allocated on the server for each connector instance other than what the server needs for its operation. In case appliances are not used, do pay attention to use built-for-purpose hardware servers where resources are not shared because like other big data solutions, these systems are greedy in terms of resources (CPU, Memory, IOPS rate) and do not perform well on virtual environments. Sources send logs to one SmartConnector only. SmartConnector level redundancy is only possible only for Syslog connectors and that when connectors are put behind a load balancer. This also provides load sharing and scalability and is a best practice. DB and File connectors do not have such options as they pull the logs from sources. When a DB or File collector is down, no log is lost until collector comes back as the logs continue to be written on local resources at the source. 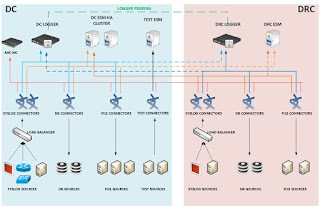 For log storage and searching, SmartConnectors in each datacenter send their logs to their respective Logger appliance hosted in the same location, providing important bandwidth savings. Each logger appliance back up the other one using the failover destinations option configured on the SmartConnectors. Thanks to the peering configuration between loggers, logs can be queried through any of the logger appliances without having to connect on each device. Logs and Alerts are archived daily both on ESM and Logger. In DR case, there is no RPO. Configurations for ESM and Logger are planned to be synchronized manually. ESM and Logger are expected to be operational instantly. Configuration backups for SmartConnectors and Loggers are collected using Arcsight Management Center (Arc MC). SmartConnector statistics and status can be easily followed using Arc MC as well. Realizing SmartConnector updates are also recommended to be done over Arc MC using the GUI. SmartConnector level configuration options (aggregation, filter out, batching etc.) are easier to be configured using Arc MC. Finally it is strongly recommended to use a Test ESM system to test all filters, rules, active lists and other configuration objects before applying them on production systems as a misconfguration in these settings may crash your ESM and make you lose very valuable data. SIEM solutions so far seem to be too much focusing on security offerings they propose and they are not offering solid redundancy and disaster solutions. From architectural perspective, there should be a redundancy option at all layers of the solution architecture. SmartConnectors being the first layer of SIEM interaction with source systems provide a nice redundancy options with “Failover Destination” configuration setting available both for HP ArcSight Logger and HP ArcSight ESM. For each log processing system, SmartConnector provides a primary destination and a failover destination. As soon as SmartConnector process discovers that logs are not successfully received by the primary destination, they are redirected to the failover destination. Preemption also exists meaning that from the moment primary destination becomes online logs are redirected back to the primary destination. More detail about the configuration can be seen in the video below. SIEM system administrators mostly come from Linux world and they prefer using Linux OS for HP ArcSight component installations. I also agree on that decision as the performance and security they provide is superior comparing to Windows Servers. However there are some situations where you have to use Windows Servers for SmartConnector installations such as when you want to use WinRM application for Windows log collection. Your company may be lacking experienced Linux admins and that could be the second reason to use Windows based SmartConnectors. Last but not the least, as you can see from the installation video, it is much easier to install Windows based SmartConnectors then Linux based ones. Below, you can find details about the basic installation of an HP ArcSight SmartConnector on a Windows Server for collecting log messages. A Windows 2008 Server installed. A user with sufficient rights to install the software. Connector destinations ( ArcSight Logger and/or ArcSight ESM) installed and working. Create a receiver on the logger to connect the connector. Create a subscription on Event Viewer to get logs. Check the configuration of log receiving folders and increase size. Define the protocol and port on which you will listen the incoming logs. Firewall permissions given for incoming log collection. Create installation directory preferably under your second partition E:\SmartConnectors\Microsoft. Install the connector to run standalone or as a service. Start the connector service from services.msc. Check events on the logger. ArcSight SmartConnector Build 7.1.4.7475 is now available! · New Amazon Web Services CloudTrail SmartConnector which includes support for Identity and Access Management (IAM), Elastic Compute Cloud (EC2), and CloudTrail Services. o Beta support for ArcSight Logger SmartMessage Pool destination type which specifies a pool of logger devices. The events are distributed among the loggers in the pool. o Beta support for ArcSight Common Event Format REST connector to collect CEF events from CEF certified cloud vendors. It also extracts assets and vulnerability information from the CEF events. o Support for non US locale dates parsing. o Added a new parser operation to extract IPv4 addresses embedded in IPv6 addresses. 2014 and 2015 have been years full of discoveries on cryptographic and algorithmic vulnerabilities starting with Heartbleed following with POODLE and several others. These vulnerabilities pushed many administrators patch their webservers, disable vulnerable protocols (SSLv2, SSLv3 and even TLS1.0) and cipher suites containing weak algorithms (RC4, SHA1, MD5 and others). ArcSight systems, working over web interfaces, are also subject to these vulnerabilities and possible attacks. Apache web server hosting Logger and Management Center interfaces should be configured to eliminate the cryptographic algorithm and protocol threats. First of all, to know the status of webserver, we will use the sslscan application with given parameters. From this output we can see that SSLv2 and SSLv3 protocols are already disabled but protocols such as RC4, DES and Diffie-Hellman are still accepted. In order to force the webserver to use secure algorithms and protocols we will modify apache configuration file httpd.conf under <LOGGER_INSTALLATION_DIRECTORY> /local/apache/conf directory, which in my own installation is /opt/arcsight/current/local/apache/conf/. It is wise to take a backup of the httpd.conf file before making any changes. Then we should edit this file with a text editor such as nano or vi. We should modify the line starting with SSLProtocol and SSLCipherSuite as follows and save the file. After this operation, so that the changes become active we should restart logger services under <LOGGER_INSTALLATION_DIRECTORY>/arcsight/logger/bin directory with ./loggerd restart command. When we recheck with sslscan, we see that vulnerable options are no longer supported. In HP ArcSight solution architecture one of the most value adding components is the Smart Connectors. With the several functions they provide, Smart Connectors really help differentiating HP ArcSight’s SIEM solution from other. So what exactly are ArcSight Smart Connectors? 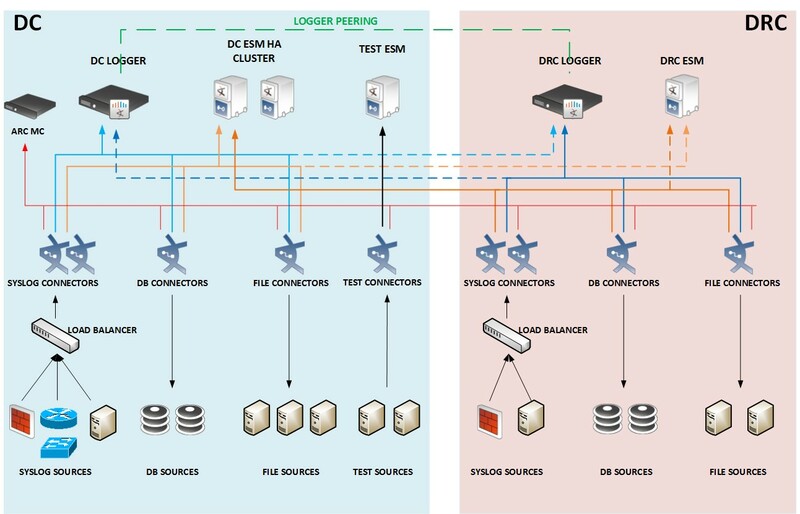 In a 3 layered SIEM Architecture, Arcsight Smart Connectors constitute the second layer between log processing systems ( Arcsight Logger or Arcsight ESM) and source systems generating logs according to defined audit policies. From technical SIEM perspective, ArcSight Smart Connectors are Java applications which allow receiving or fetching logs from one defined log source, which can be several devices sending their logs in syslog format over the same protocol and port number (e.g. UDP 514) or an application writing its logs to a flat file. ArcSight Smart Connectors come with 256 MB minimum memory size and that memory is adjustable up to 1024 MB by configuration agent.properties file, among other connector properties to be changed according to your specific needs. One physical server can host up to 8 connector processes, meaning that you can collect logs from 8 different source groups as long as your server support that much capacity. Below, you can find details about the basic installation of an HP ArcSight Smart Connector on a CentOS Linux server for collecting syslog messages. 1. A RHEL or CentOS Linux 6.X Server installed. 2. Root or sudo rights for connector user. 4. Connector destinations (Logger and/or ESM) installed and working. 5. Define the protocol and port on which you will listen the incoming logs. Choose port numbers over 1024 if you are installing with a non-root user as non-root users are not allowed to listen ports below 1024. 1. Create installation directory under /opt path. In this example it is /opt/arcsight/connectors . 2. Create a receiver on the logger to connect the connector. 3. Run the connector binary you previously downloaded. (From /home/arcsight directory in my installation). 4. Install the connector to run standalone or as a service. 5. Check events on the logger.